HEBER-OVERGAARD — As of February 1, the bodies of 10 horses and two horse skeletons have been found in the Apache-Sitgreaves National Forest east of Heber. That brings the total to 12 horses that members of the Heber Wild Horses group believe to have been intentionally shot and killed. A bay mare and a black stallion with a white blaze referred to by some as “Big Daddy,” were discovered dead and reported to the Forest Service last Friday morning. According to witnesses, Forest Service Deputy John Lopez and a veterinary expert responded quickly to investigate. A former brand inspector, Zeke Austin, was also at the scene according to the reporting parties. Advocates believe the two horse discovered on Friday may have been killed in late January, along with several others. Their theory, however, has not been confirmed. They do hope that the varying stages of decay in the carcasses will ultimately help investigators pinpoint a more specific time of death. In another unfortunate turn of events, a palomino mare referred to as “Angel,” was found alive but injured in the same area and had to be euthanized later that same day. Cecema-Hogsett of Citizens Against Equine Slaughter, (CAES), operates the political action arm for Heber Wild Horses Freedom Preservation Alliance. In a phone conversation with the Independent, the organization expressed appreciation for how quickly the Forest Service has been responding to their calls. However, the advocates of the Heber Wild Horses still express an opinion that the investigation of the horse deaths are “too little, too late.” Late last year, the organization began escalating their actions, expressing their concerns to Forest Service regional and national offices. They say they received little or no response last year, which prompted their recent letters to Congressmen Raul Grijalva and Tom O’Halleran. During the federal government shutdown, it was unclear who the public should call with reports or concerns about the horses. In addition, the Forest Service dispatcher was overwhelmed with calls about the Heber Wild Horses on the line meant for reporting forest fires. “This line is for Wildland Fire with our interagency partners in Fort Apache, the State of Arizona, and NPS,” explained John Whatley of the Apache-Sitgreaves National Forests in an email to the Independent last week. “I also contacted Navajo County Sheriff’s Office with tips but it was during the government furlough so I was directed back to the Forest Service because that’s what everyone was instructed to do at the time,” says Cecema-Hogsett. “We recognize that NCSO is stuck in the middle of all this and we were really impressed with Navajo County Deputy Shawna Manygoats,” she adds. “We would love to have any tips that the public or any horse advocates have collected,” said Navajo County Sheriff’s Office (NCSO) Chief Deputy Randy Moffitt in a phone conversation with the Independent on Wednesday. 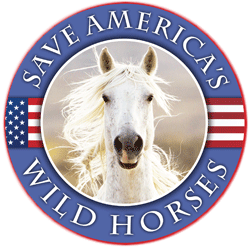 “Unfortunately, we have not received any tips through the WeTip line regarding the Heber Wild Horses, however, it is still anonymous and available 24/7,” he added. Although the Forest Service has insisted that they are the lead agency in the ongoing investigations, they have instructed the public to contact the NCSO dispatch line. The Forest Service also advocates the use of the WeTip Hotline because it’s designed to forward information directly to them. “If the horse deaths are the result of something criminal, then we would look to begin working with the Department of Justice and other agencies such as the U.S. Attorney’s office,” explained Forest Service Southwestern Region spokesperson Shane L. Martin, in a phone conversation with the Independent last week. Navajo County Sheriff K.C. Clark recently visited Washington D.C. to help secure federal funding for the department and task force, and apparently spoke to Congressman Tom O’Halleran about the horse deaths. O’Halleran wrote to the Forest Service, urging action. During the time of Clark’s visit the Independent was forwarded a copy of a letter addressed to U.S. Forest Service Chief, Vicki Christiansen. “…many constituents feel their questions have gone unanswered by your agency,” the letter states. “If the horse deaths are the result of something criminal” ? Seriously? What other reason for horses being SHOT & killed would it be the result of? I sure hope someone starts paying attention. And in all those words, nothing about the bullets found in the carcasses, yet again. Who do these people work for? IF … IF … IF…!!! What do they mean IF !!! These killings are a federal offence. The Heber Wild Horse Herd is a federally protected herd in the Apache-Sitgreaves National Forest in Arizona. The Wild Horse and Burro Act provides specific protections to “all unbranded and unclaimed horses and burros on public lands of the United States,” and makes it a CRIME for anyone to harass or kill these animals on federal land. … The BLM was also permitted to close public land to livestock grazing to protect wild horse and burro habitat. My money is on a disgruntled cattle rancher. Anyone else find it ironic, if not suggestive, that one of the “Related” stories at the bottom of this article is about how a local rancher wanted the entire herd to be removed, via adoption, euthanasia, or sent to the slaughterhouse? That was in 2015, maybe he got tired of waiting.